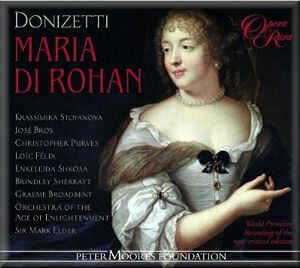 Maria di Rohan was Donizetti’s penultimate opera. He composed it for Vienna, where its premiere took place at the Kärntnertortheater in June 1843 where it was widely acclaimed with the Austrian imperial family travelling especially to attend. The work was quickly performed in other European cities before arriving in at the Théâtre-Italien, Paris, later that year. For Paris, Donizetti made major revisions, much as he had done with Linda di Chamounix after its transfer to the French capital the previous year. Despite his declining mental health, the revisions are musically significant in their compositional colour and do alter the dramatic balance of the opera. Prominent in these revisions was the recasting the role of Armando as a mezzo-soprano instead of a second tenor. The second CD in this issue contains some of the music of these revisions (trs. 8-11) plus a new cabaletta written for the tenor Gaetano Fraschini for a production in Naples in the autumn of 1844 (tr.12). What this Opera Rara issue mainly concerns is a performance of the work as it was given at the premiere in Vienna. Given Opera Rara’s predilection for including music written for a work, I can only regret that they did not record the additional final aria for Maria that Donizetti wrote, particularly given Krassimira Stoyanova’s singing in this issue. Its exclusion at the premiere may have been at the request of Tadolini, who had created Linda di Chamounix in Vienna in 1842, but its inclusion at the Buxton Festival in 2011, with a mezzo di Gondi, provided a thrilling conclusion. As there is no shortage of space its inclusion would have given purchasers the choice and chance of some excellent Donizetti. The opera is set in early 17th century Paris in the court of Louis XIII at the time of Cardinal Richelieu's ascendancy as First Minister. It was a period when duelling to the death, either with swords or pistols, was common. At the behest of Maria de Rohan, the Comte de Chalais, a political power in the land and adversary of Richelieu, intercedes with the king to save the life of the Duc de Chevreuse who has been condemned to death for having killed, in a duel, a nephew of Cardinal Richelieu. Chalais is a former lover of Maria. Old flames are lit. But Chalais discovers that Maria has secretly married Chevreuse when he is involved in a challenge to a duel with Armand de Gondi, a young dilettante around the Court who has insulted her. Chevreuse, decides to replace his benefactor in the duel. In a complex set of circumstances as Richelieu resumes power, and involving a hidden letter and a secret passage, Chevreuse discovers that his friend has been the lover of his wife and the drama is resolved with more deaths. The recording sets the singers somewhat behind the orchestra. Conducting the Orchestra of the Age of Enlightenment Sir Mark Elder brings out the dark colours and dramatic centre of the action with his customary intensity of feeling for this composer’s works. Of the soloists, major vocal honours must go to Bulgarian soprano, Krassimira Stoyanova in the eponymous title role. Her extraordinarily wide range, pure in all its registers whilst being allied to a warm tone and expressive singing, is all one could expect and hope for in a performance of dramatic bel canto. I would hope to hear her featured again by Opera Rara perhaps in Donizetti’s final stage work, Caterina Cornaro. In the appendices of the arias allocated to a mezzo Armandi Di Gondi in the Paris version, Enkeledja Shkosa sings with creamy-voiced assurance. If the only two ladies in either edition carry the female burden, the male contingent has much more to do. I personally find the rather plangent tone of José Bros somewhat lacking in ideal variety of vocal colour. Whilst generally singing with taste, flexibility and elegant phrasing as Chalais, he is stretched vocally at times as in the added cabaletta written for Gaetano Fraschini referred to above. At Buxton, the cabaletta immediately brought to mind the early works of Verdi, and even Il Trovatore. It is perhaps no surprise to know that Donizetti was present at the premiere of Nabucco in Milan in March 1842 and conducted the work in Vienna immediately prior to the premiere of Maria Di Rohan. As Chevreuse, the other man in this complex love triangle, Christopher Purves sings strongly with a good variety of tone and expression whilst missing the bel canto ideal as his top range loses focus and line under pressure. Of the lesser roles, Graeme Broadbent sings strongly as Visconte di Suze whilst Brindley Sherratt is resonant as De Fiesque and Loïc Félix an adequate tenor Gondi. The contribution of the Geoffrey Mitchell Choir is, as always in Opera Rara issues, notable by excellence. The associated booklet has a full track-listing and synopsis. The extensive essay by Jeremy Commons is scholarly and illuminating and is a perfect complement to Ashbrook’s definitive, but now rather dated Donizetti and his Operas (Cambridge University Press 1982). The performance history and cast lists are interesting. The libretto is given in full with translation in English.